Yoshitaka Amano (天野 喜孝 (formerly 天野 嘉孝), Amano Yoshitaka, born March 26, 1952) is a Japanese artist, character designer, illustrator and a theatre and film scenic designer and costume designer. He first came into prominence in the late 1960s working on the anime adaptation of Speed Racer. Amano later became the creator of iconic and influential characters such as Gatchaman, Tekkaman: The Space Knight, Hutch the Honeybee and Casshan. In 1982 he went independent and became a freelance artist, finding success as an illustrator for numerous authors, and worked on best-selling novel series, such as The Guin Saga and Vampire Hunter D. He is also known for his commissioned illustrations for the popular video-game franchise Final Fantasy. Since the 1990s Amano has been creating and exhibiting paintings featuring his iconic retro pop icons in galleries around the world, primarily painting on aluminium box panels with acrylic and automotive paint. He is a 5-time winner of the Seiun Award, and also won the 1999 Bram Stoker Award for his collaboration with Neil Gaiman, Sandman: The Dream Hunters. Amano's influences include early Western comic books, art nouveau, and Japanese woodblock prints. In early 2010, he established Studio Devaloka, a film production company. Amano's design work for early anime series such as Gatchaman drew inspiration from Western comic books. Amano was born in Shizuoka, Shizuoka Prefecture, Japan. As a young adolescent, he was fascinated with drawing. In 1967, he began working in the animation department of Tatsunoko Productions, where he was introduced to the early Japanese anime movement. His first paid project was for the Speed Racer anime franchise. He was a character designer for anime shows such as Time Bokan, Gatchaman, Tekkaman, and Honeybee Hutch. In the 1960s, Amano was exposed to Western art styles through comic books, which he claims among his artistic roots. He has cited Neal Adams as his favorite comic book artist, noting that he would often purchase used comics based on Adams's cover artwork, only to be disappointed that the interior artist was different. Amano was also fascinated by the art styles of psychedelic art and pop art of the West, particularly the work of American Pop artist Peter Max. In the 1970s, Amano studied the artworks of the late 19th century and early 20th century European movement of Art Nouveau, as well as the ancient Japanese hand woodblock printing work of Ukiyo-e. Amano remained at Tatsunoko Productions until 1982. During the 1980s, Amano concentrated on illustrations for science fiction and fantasy works. Combined with the influence of his prior experience in animation, this focus resulted in a personal style influenced by both modern surrealism and realism. He left Tatsunoko Production and started his activities as a freelancer in 1982. He did illustration and cover page design of Kimaira series, written by Baku Yumemakura, from this year. In 1983, he illustrated the novel Demon City Shinjuku and the first in Hideyuki Kikuchi's Vampire Hunter D novel series. He also worked as a character designer on the 1985 movie adaptation of Vampire Hunter D, which was one of the first anime movies to be released outside Japan. In interviews, however, Amano has stated that he was not pleased with the final product of the movie. His illustrations begin to be published in collections such as Maten in 1984. The animation title Amon Saga was written by Baku Yumemakura with character design by him. A manga version of Amon Saga was also released. Amano's work on the Final Fantasy series, as with his science fiction and fantasy illustrations, is known for its wispy lines and vibrant use of color. 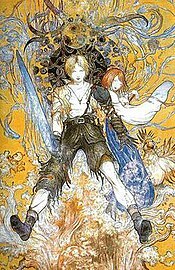 In 1987, Amano joined Square (now known as Square Enix) to work on a role-playing video game for the Nintendo Entertainment System: Final Fantasy. Amano produced conceptual design pieces for the game in both traditional and computer designed artwork. At this time, he also worked for another video game company, Kure Software Koubou, producing box cover illustrations as well as some character designs. This work included designs for Kure's First Queen series. Following Final Fantasy VI in 1994, he stepped down as the main character, image, and graphic designer of the series. He continued to provide promotional and character artwork for the following games and to design their title logos. In 2006, Hironobu Sakaguchi, the former designer and creator of the Final Fantasy series, recruited Amano and composer Nobuo Uematsu to work on video games at Mistwalker. Amano and Nobuo Uematsu worked together again on videogames like Fairy Fencer F at Compile Heart. Amano's first exhibition, called "Hiten", was held in 1989 at Yurakucho Mullion in Tokyo, Japan. In 1990, he began to work as an artist and set designer for stage theater. His first work for theater was Tamasaburo Bando's Nayotake. Beginning in 1995 with his work at the Biennale d'Orléans in France, he received increased recognition outside Japan. Further international exhibitions followed, including the 1999 "Hero" at the Angel Orensanz Foundation and the 1997 workshop and exhibition "Think Like Amano". In 1998, Amano appeared as Hiroshi in the 1998 movie New Rose Hotel, loosely based on the William Gibson short story of the same name. In 2000, Amano illustrated Neil Gaiman's The Sandman: The Dream Hunters, which won several awards and was nominated for a Hugo Award. In 2001, Greg Rucka and Amano collaborated on another comic book tale, Elektra and Wolverine: The Redeemer. His character designs were used in another Vampire Hunter D movie entitled Vampire Hunter D: Bloodlust. In 2006, the first volume of his HERO series was released by Boom! Studios. He was key visual and costume designer for movies written by Baku Yumemakura, including Onmyoji, Onmyoji 2, and Taitei no Ken. He illustrated three album covers for the Japanese power metal band Galneryus: The Flag of Punishment (2003), Advance to the Fall (2005), and Beyond the End of Despair (2006). In 2004 Amano was asked by creative director GK Reid to create illustrations in collaboration with author Neil Gaiman and featuring David Bowie and Iman as sci-fi characters, for "The Return of the Thin White Duke" a portion of which were published in V Magazine. In 2008, Amano created an illustrated adaptation of Wolfgang Amadeus Mozart's The Magic Flute, published by Radical Comics. He also collaborated with Christopher "mink" Morrison of Quentin Tarantino's A Band Apart production company, providing illustrations for the novel Shinjuku and Shinjuku Azul, as well as a third unannounced follow up and an online game, Shinjuku Nexus. He was the character designer for the 2009 Jungle Emperor (Kimba the White Lion) TV special, directed by Gorō Taniguchi, to commemorate both the 50th anniversary of Fuji Television and the 80th anniversary of Osamu Tezuka's birth. In 2010, following a small solo art exhibition tour titled "Devaloka" it was announced that Amano had established a film production company, Studio Devaloka, and would be directing a 3D anime titled Zan, with additional projects to be announced in the future. On December 15, 2010, the official website for the film, now titled Deva Zan, was unveiled, along with information concerning an upcoming press conference, to be held on December 21, 2010. The roughly ten-minute-long conference revealed details about the project, including staff, as well as a short trailer for the film, which stylistically emulates the look of Amano's paintings. In April 2012, an illustrated novel adaptation of the work was announced by Dark Horse Manga. To be released in January 2013, the novel will be Amano's debut as an author and will include over 240 original illustrations. Despite a projected 2012 release date, Amano stated in an October 2012 interview that the animation project was still in its development and funding stages and may instead be realized as a TV series. The possibility of a video game adaptation was also mentioned. In 2013, Amano collaborated with Japanese rock star Hyde (L'Arc-en-Ciel/VAMPS) on an art exhibition titled Destiny and Decay: Nippon Evolution. While continuing his freelance and gallery work, in recent years Yoshitaka Amano has begun to groom his only son, Yumihiko Amano, as his successor. In late 2017 their first joint art exhibition, Fantasy Art Collection, was announced. ^ a b ANS Exclusive Interview: 10 Questions To Yoshitaka Amano Archived August 27, 2006, at the Wayback Machine; retrieved 2006-09-16. ^ a b Powells.com Bibliography "The Sandman: The Dream Hunters"; retrieved 2006-09-16. ^ McCarter, Charles. Flights of Fantasy Archived October 3, 2006, at the Wayback Machine; retrieved 2006-05-09. ^ RPGamer interview. Retrieved on 2006-09-16. ^ a b c 1UP.com A Day in the Life of Yoshitaka Amano Archived 2007-09-27 at the Wayback Machine; retrieved 2006-09-16. ^ Q&A with Yoshitaka Amano; retrieved 2009-02-12. ^ a b c Unno, Hiroshi. Amano: The Complete Prints of Yoshitaka Amano Collins Design: November 4, 2003. ISBN 0-06-056763-5. ^ "Yoshitaka Amano & Hideyuki Kikuchi Exclusive Interview". The Diva Review. 2008-09-27. Retrieved 2016-08-18. ^ Amano's World The Art of Yoshitaka Amano English Website Bibliography of Maten; retrieved 2006-09-16. ^ ABC News The Genius Behind Final Fantasy. Retrieved on 2006-09-16. ^ Kure Software Koubou Official Homepage Website; retrieved 2010-05-01. ^ Japan Vibes interview Archived May 11, 2006, at the Wayback Machine; retrieved 2006-09-16. ^ Amano, Uematsu and Compile Heart developing Fairy Fencer F. Retrieved on 2013-05-08. ^ Amano's World The Art of Yoshitaka Amano English Website Exhibitions. Retrieved on 2006-09-16. ^ Amano's World The Art of Yoshitaka Amano English Website "HERO Exhibition"; retrieved 2006-09-16. ^ Amano's World The Art of Yoshitaka Amano English Website "Think Like Amano Exhibition"; retrieved 2006-09-16. ^ Combustible Celluloid Movie Review New Rose Hotel; retrieved 2006-09-16. ^ CNN Review "A dark tale of enduring charm", December 23, 1999; retrieved 2006-09-16. ^ "Cinescape Comics Book Review Elektra and Wolverine: The Redeemer". Archived from the original on 2012-09-26. Retrieved 2006-09-16. ^ cdjapan.co.jp Galneryus listing; retrieved 2006-09-16. ^ Christopher Borrelli. "Neil Gaiman on his love for David Bowie", ChicagoTribune.com; accessed July 28, 2015. ^ From Vampires to Mozart; retrieved 2008-12-13. ^ Experience the Mystery and Majesty of Amano’s Shinjuku; retrieved 2009-02-12. ^ Geass' Taniguchi, FF Games' Amano on New Jungle Emperor, January 27, 2009; retrieved February 12, 2009. ^ a b Deva Zan official website; accessed July 28, 2015. ^ Dark Horse Manga: Announcing Deva Zan!, darkhorse.com; accessed July 28, 2015. ^ Interview with Yoshitaka Amano, AnimeNetwork.com; October 29, 2012. ^ Destiny and Decay: Nippon Evolution Archived June 18, 2013, at the Wayback Machine, amanoxhyde.com; accessed July 28, 2015. ^ "Fairy Fencer F detailed in Famitsu". Retrieved May 10, 2013. ^ "Exclusive Interview with Syu". Retrieved 2016-10-01. Wikimedia Commons has media related to Yoshitaka Amano.